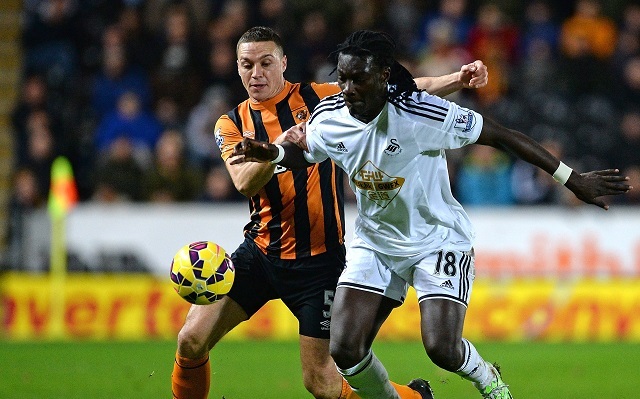 Neil Warnock’s Crystal Palace have made a bid for Swansea’s Bafetimbi Gomis, the striker who just one month ago was linked with Arsenal. The Daily Mail claims that Palace have made an opening bid of £6m for the player. Swansea today announced they have completed a loan deal for Benfica striker Nelson Oliveira, but they are about to lose Wilfried Bony to the Africa Cup of Nations, and will not want to be left with just one striker. They almost certainly wouldn’t sell the star if they had the choice, given that he’s just six months into a four year deal, but the twist comes with the £7m release clause in the French international’s contract. That temptingly low fee is attracting the attentions of several clubs in the Premier League, with Palace hoping to steal a march on their competition with such an early offer. There’s only so much the manager can do if the release clause does exist, but he has assured Gomis games in Bony’s absence, and it’s hard to see the Frenchman leaving just yet.